What is Pay Per Click - AIMWEB Global Web Solutions - Leaders in Search Engine Optimization, Pay Per Click Management and Search Engine Marketing. Cape Town, South Africa. The world of advertising is changing, and fast. Traditional methods of getting your brand, product or business exposure are becoming less and less effective. Television, newspaper and radio are quickly becoming irrelevant in an online, connected world. To stay ahead of the curve one has to delve into online advertising. As you can see only relevant results to the search “running shoes” are shown. However, and this is important, the first three results are paid to appear as indicated by the small ad icons next to them. Only the fourth ad (and further downwards) are displayed without their owners having to pay to appear there and they appear there as a result of SEO. 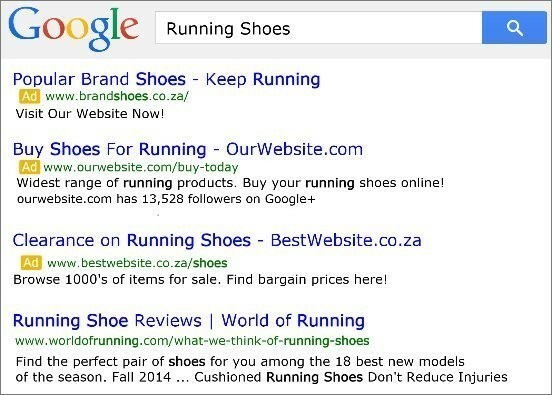 This means that paying to show your ad on Google, for whatever search terms you wish (like “running shoes”), will get prominent exposure to your business regardless of where it normally appears on search results. This is the great thing about Pay Per Click advertising. You advertise to an engaged, interactive audience that is actively searching for products or services relevant to your business. People who aren’t interested aren’t shown your ad. This is a revolution from television, newspaper, radio ads and highway billboards which have little to no control over their targeted market. 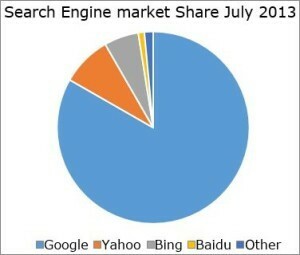 Network, which accounts for roughly two-thirds of all online searches. Anyone can advertise on the Google Search Network using Google AdWords, but do attempt it without proper certification and training is inviting financial disaster. For the security of a well managed AdWords Ad campaign it is best to acquire the services of a certified and experienced AdWords marketing team.This is where Aimweb steps in. To see how our AdWords specialists can save you time and money, allowing you to focus on your business, see What can Aimweb do for you? If you would like to explore PPC ads more have a look at What does a Pay Per Click ad look like? If you wish to fast track getting your business online skip straight ahead to Pay Per Click costs and rates or How do I get started?